Flash flooding in Tbilisi, Georgia has claimed at least a dozen lives, and devastated the city’s zoo—leaving some 20 wolves, eight lions, six tigers, as well as jaguars and bears missing. Some of the animals are believed to have drowned in the floods, while others are roaming the streets of the capital causing alarm among residents and a sizable challenge for wildlife and law enforcement officials. One lion and several wolves have already been shot dead, and the zoo is pleading with the public and city officials not to kill any more escaped animals. The flooding occurred on Sunday, June 14, when heavy rainfall caused a landslide that blocked a stream—and as the floodwater grew, the temporary dam burst and sent a torrent of water into Tbilisi. Around 40 homes have been destroyed, and the zoo and a dog shelter inundated with water. 60 homeless dogs are reported to have drowned at the shelter, and three zoo employees are believed to have died in the flash flood. 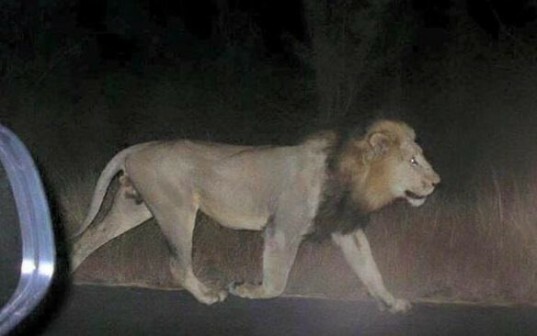 Zurab Gurielidze, the head of the zoo has stated that many animals are still missing, with one young white lion named Shumba found dead from a gunshot wound to the head on zoo property. Meanwhile, there are reports that six wolves were shot dead in the yard of a university, and one hyena killed after it chased a security guard. Photographs on social media also suggest that tigers have been shot dead. A hippopotamus found grazing in Heroes’ Square was successfully shot with a tranquilizer dart and returned to the zoo, while some free-roaming penguins were safely captured. But as rumors swell of residents arming themselves in fear of the free-roaming wild animals, Gurielidze has made a public plea that no more residents of the zoo be killed. He told reporters that “If a predator attacked a person then it’s understandable but there are cases that will need to be investigated,” as some twitter users claim that police are not adequately equipped with tranquilizer darts. The search and rescue operation is continuing, as 24 people remain missing, alongside the escaped animals. 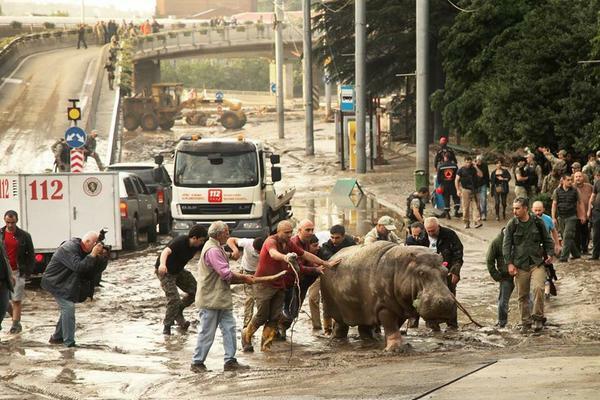 Flash flooding in Tbilisi, Georgia has claimed at least a dozen lives, and devastated the city's zoo—leaving some 20 wolves, eight lions, six tigers, as well as jaguars and bears missing. Some of the animals are believed to have drowned in the floods, while others are roaming the streets of the capital causing alarm among residents and a sizable challenge for wildlife and law enforcement officials. One lion and several wolves have already been shot dead, and the zoo is pleading with the public and city officials not to kill any more escaped animals.